Yoga therapy has been used for many years due to its mental and physical health benefits. Through yoga postures, meditation, breathing exercises, and guided imagery, yoga therapy integrates the body, mind, and spirit. Scientific research has been done to determine its benefits and efficacy. The results are amazing! Due to its incorporation of elements from psychotherapy and physical therapy, yoga therapy is capable of preventing and treating a diversity of medical conditions of both mind and body. Today, yoga therapy is actively used in the treatment of psychological disorders, such as depression and anxiety. It’s also showing also great results in patients with schizophrenia, post-traumatic stress disorder (PTSD), and autism. Besides these, mental health professionals find yoga therapy very helpful in overcoming addiction problems and substance abuse issues. Yoga can increase the levels of the neurotransmitter GABA, commonly low in these patients. For the physical benefits, experts also recommend yoga therapy. because it integrates body and mind, being very effective in medical conditions such as back pain, chronic fatigue, heart diseases, blood hypertension, asthma, multiple sclerosis, and chemotherapy side effects, among others. Is important to mention that yoga therapy may not a complete treatment method per se, but a complementary one. This therapy, specifically in coordination with a doctor who identifies the health problem, can create the best complete treatment plan for each patient. When choosing the right yoga therapist, you have to take into account that these therapists can be either straight forward yoga teachers, or those who also hold degrees in psychotherapy, chiropractic, medicine, physical therapy or other similar fields. The important thing is to find a teacher with solid experience and training to develop a positive and therapeutic relationship. In the case of our yoga teachers, the training emphasis is on orthopedic injuries and stress relief techniques. What is yoga therapy? Miami and Aventura yoga. Nowadays, human beings are suffering more and more from mental stress and other related issues that deeply affect their day to day life. It’s pretty intense here in Miami! People with pain turn to conventional and traditional medicine to solve their health problems. Although this type of medicine focuses on treating symptoms through medication and surgical procedures, many times it does not solve the cause of the problem. On the other hand, alternative types of medicine vastly known and developed by older Asian cultures focus on finding and treating the root of the problem, healing both body and mind. Among the multiple treatment modalities, the use of sound has been recently researched and applied by many specialists on the matter. Sounds are used due to its capacities of traveling through water and air, stimulating the patient´s central nervous system and reaching every part of the body. These sounds produce vibrations, which are capable of positively affecting each cellular element of the patient. Having said this, it has to be understood that sound is heard not only through the ears but also through every cell in the body, thanks to vibration. The healing power of sound can be very helpful when applied to patients suffering from mental stress, low back pain, anxiety, fatigue, and digestive problems, to name a few. Sounds and vibration therapy is applied by using a variety of techniques that include yoga, meditation, crystals and Tibetan sound bowls, chanting, among others. 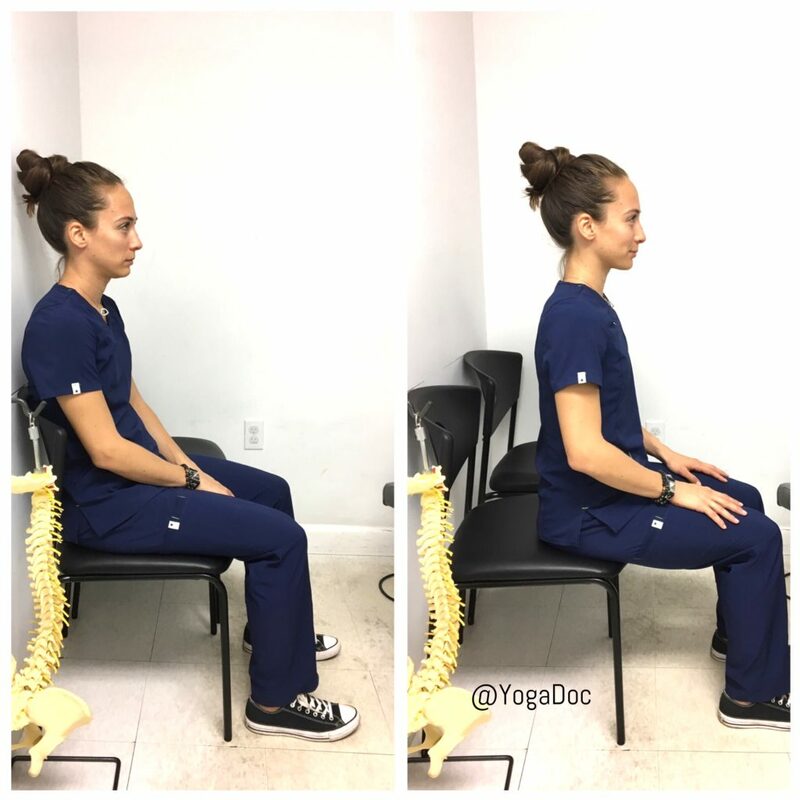 All these modalities are practiced at our chiropractic office in Aventura with the purpose of reaching a meditative state so profound and concentrated capable of healing from inside out. The best thing is that this is a drug and surgery-free treatment method! Scientific research shows that sound has healing properties because is capable of positively touching and transforming both body and mind, healing at physiological and spiritual planes. Therefore, it is valid to say that sounds and vibrations play a positive role in the treatment of virtually any medical condition. 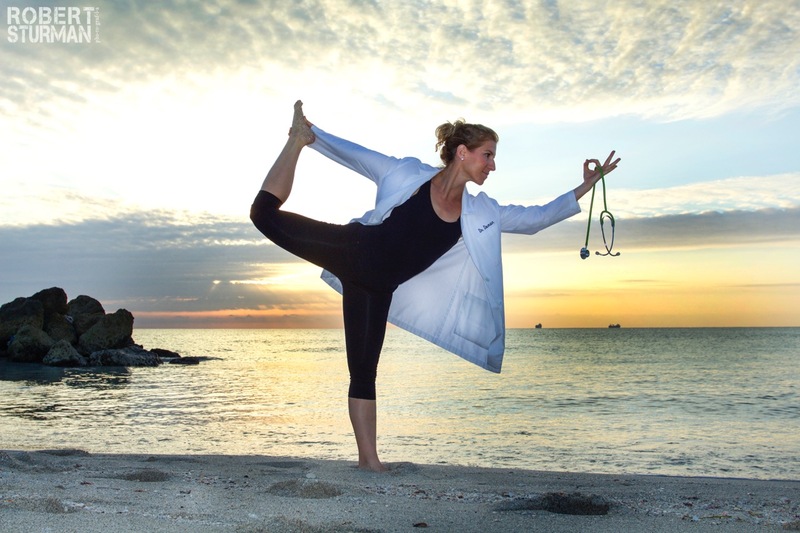 Happy Holidays from Dr. Doman and the Team at Miami Sports Chiropractic + Yoga Center! I hope this note finds you healthy and energetic in December! 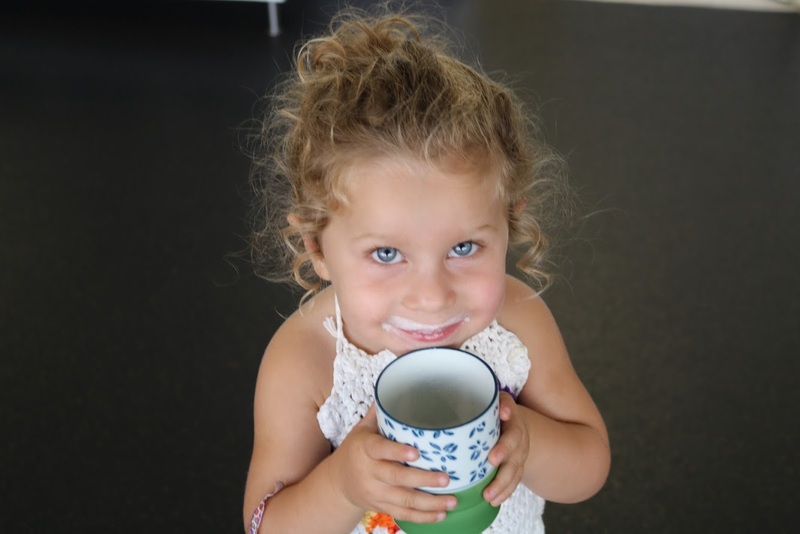 …it’s hard to close the door when your toddler thinks the patients are HERS, and it’s HER job to treat them! In the professional arena, I served another year on the Board of Directors at the state level for the Florida Chiropractic Association. In the fall I was a guest lecturer at the University of Florida on posture and brain health in gaming. Stay tuned for exciting news regarding our PGA Tour Players, and the practice in 2019! My whole heart thanks you for trusting us to assist you, your family and your friends during the most pivotal times of your life. I am in awe of your integrity and dedication in taking responsibility for your health. I look forward to being a continued partner with you in upcoming decades. It has been over 9 years, now! Thank you for trusting me to be your health and healing advocate in lieu of excessive drugs and surgery. Click here for a 3-minute daily meditation to take the edge off of your holiday-itis. If you’ve ever been to a chiropractor, it may be no surprise that you were given exercise recommendations, nutrition advice, or benefited from other complementary therapies. The main goal of chiropractic care is spinal health and alignment, which is done through spinal adjustments and various soft tissue techniques. As a holistic approach to healing, chiropractic care focuses on the body as a whole working to ensure optimal wellness for patients. Among many additional treatments and therapies that may be recommended by a chiropractor, yoga is one of our favorites at Miami Sports Chiropractic & Yoga Center in Aventura. I don’t always practice yoga on the beach. But when I do, it’s with a lab coat and stethoscope. Yoga is an ancient method of exercise, meditation, and breathing that dates back at least 5,000 years. While many (erroneously!) believe that yoga exists solely for those blessed with flexibility and natural zen, this could not be farther from the truth! …and the list could go on! Why Combine Chiropractic With Yoga? Chiropractic helps to decrease pain, restore proper motion to the spine, and improve overall health of the body. Yoga helps to support this on-going healing process by improving physical and mental balance. Have you ever met someone who wasn’t physically flexible? Did that lack of flexibility extend out into their personality and ability to withstand the stressors of life? When yoga is done correctly, such as with our teachers at Miami Sports Chiropractic & Yoga Center, who are trained to work with safe alignment and pre-existing injuries, it can greatly improve the strength of the physical and mental muscles that work to stabilize body and brain in alignment. Yoga is a perfect complement to your chiropractic care and will help lead you not only to less pain but to a healthier, happier life. Healthy people heal better. Let Us help you! Picking a tissue up off of the floor ‘the wrong way’ didn’t cause your low back to blow out. Nor did that weird posture in yoga. Or lifting heavy weights in Crossfit. I know that you stretch your low back and hamstrings everyday. And do your core work. And tried Pilates and liked it too! So why does your lower back still hurt all day, every day? Your low back is constantly in pain because you’re giving it a job it can’t handle. That it isn’t designed to handle! Your low back, located at the mid section of your entire upper and lower body is meant to connect the two. For those familiar with New York City, it’s Grand Central Station between upper and lower Manhattan. Your lower back holds your body still so that your arms and legs can sit, stand, walk, run, reach, bend, push, pull, throw, lift…. the list goes on! Your arms and legs are the action celebrities of the body. Your low back holds your body still for them. Did you know that you’re doing 3 major movements everyday that bend and flex your spine into pain? Miami Sports Chiropractic & Yoga Center, Unique Solutions for Pain Resolution. Aventura Miami Florida. 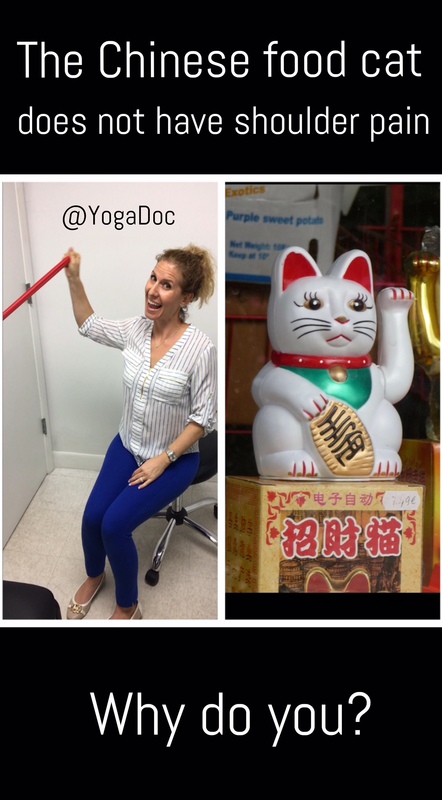 Doing my rotator cuff exercises like the cat from Chinese food restaurants. I’ve done it all somewhat extensively: American-style boxing, Muay Thai, kick boxing. Everything a Jewish girl needs to know. 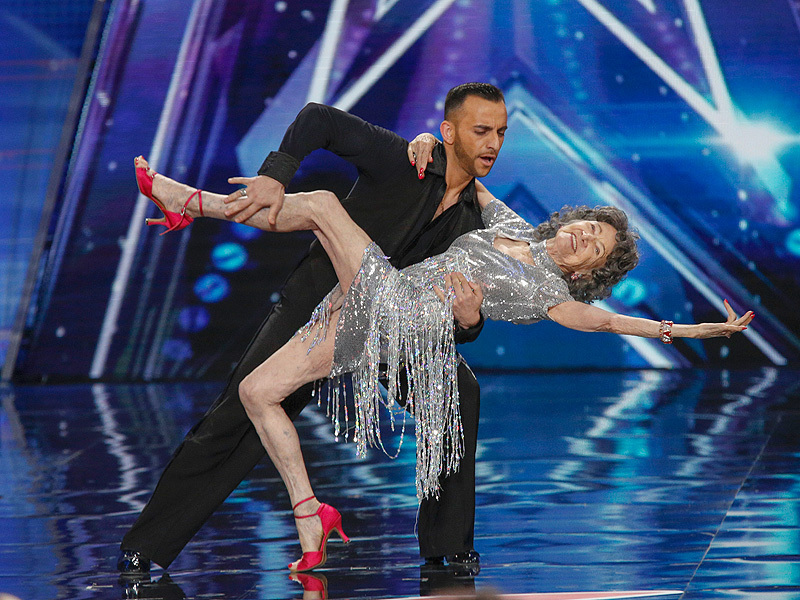 Strictly for fun and fitness of course. 10 years ago I developed mild left rotator cuff impingement from surfing 24-7 (think: overhead paddling) and not cross training enough to preserve my shoulder health. Boxing brought that shoulder pain out with a vengeance. Switching to south paw, aka ignoring that there was a problem, didn’t help. Fast forward to today’s training session. Mr. Kick Boxing Guy said… why DON’T you just do a little bit everyday to strengthen your rotator cuff if you know it could be an issue anyway? Where do I begin! Why do I think rotator cuff exercises are merely sprinkles on the cupcake of shoulder rehab? The rotator cuff is a tiny little band of muscles that wraps around the head of the humerus. For all intensive purposes and this blog, let’s just say that they have a little job as well: to rotate the arm in towards you and rotate it away from you. 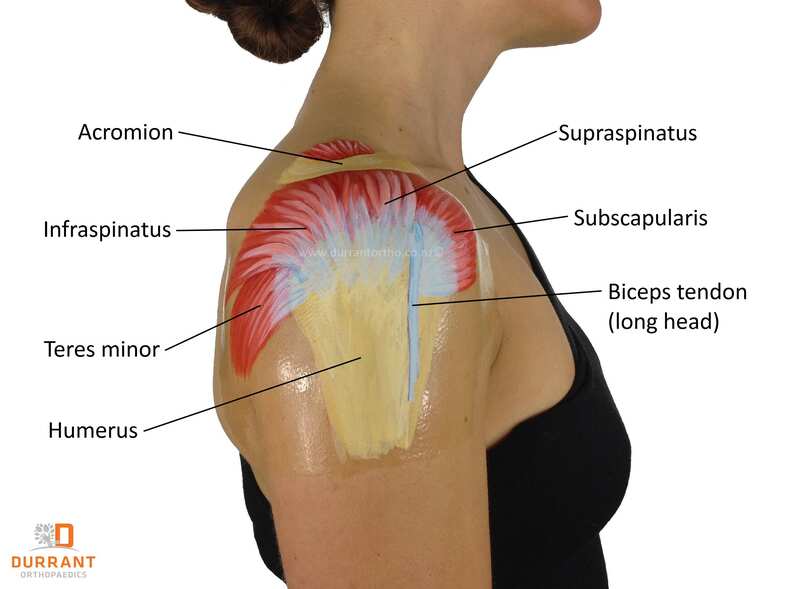 Impingement or pinching of the rotator cuff (and other soft tissues of the shoulder) can occur from giving that tiny band of muscles a MUCH bigger job than they are intended for, say, anchoring and moving your entire shoulder/arm in ALL directions and at ALL times. They get pinched and angry at you. There are way bigger and stronger muscles that are intended for those jobs! NO shoulder muscles can perform their intended job unless they are anchored on to an upright and decompressed rib cage. I find, however, that ALL people who have shoulder pain and have some version of slouchy posture. Shoulder pain on the left, guaranteed. You can’t fix the shoulder until you align and maintain an upright spine and rib cage. Can’t. Cannot. The shoulder blade is a coat hanger and your spine is the closet. You can’t hang something big, like an entire arm, on a slouched and falling over spine. Check out FoundationTraining.com for more info regarding spine and rib cage decompression exercises that ARE the precursor to proper shoulder rehab. You can leave endless shoulder retraction exercises in 1985 shoulder rehab where they belong. CLICK HERE FOR VIDEO If your posture is already on-point and you’re ready for the shoulder sprinkles, here is the no-more-excuses approach to getting your rotator cuff rehab in at the office. No gym required. Not having luck getting rid of your shoulder pain? Frozen shoulder? Bursitis? Let us help you.